In an aim to challenge Australians perception of the brand and position Breville and it’s Dual Boiler™ in a complex opinionated premium espresso market, we needed to highlight the premium features and specification of the espresso machine. However these features are hidden inside the machine and not apparent to consumers. 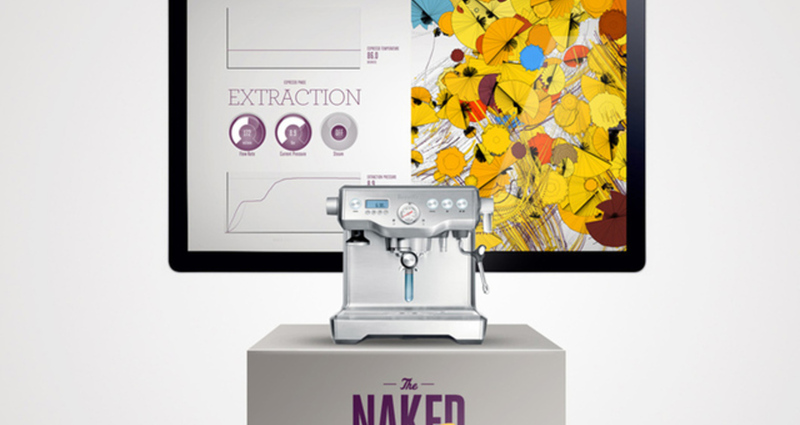 By creating a unique product demonstration that re-engineered the Dual Boiler™ to lay bare the consistency of its commercial grade features through a visualisation of live data and art we were able to showcase the internal science and brillance of the espresso machine. A processing application was developed in order to graphically display the temperature, flow rate, pressure and steam in real time. The animation speed, number of shapes, rotation and position were carefully connected with the machine's behaviour during the brewing process. Each unique piece of art was then printed immediately onto the cup, and artwork made available to consumers to download post the event.